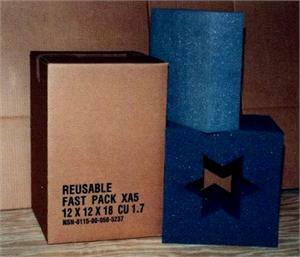 Charcoal foam per MIL-PRF-26514. 6-point star foam centers. 3 cushioning components. V3C corrugated cartons. NSN 8115-00-134-3655. Price Per Each (Minimum 1 Case). 4 Per Case Shipping Extra. Call or email BIISCO for quote.